Between the Col du Pillon and the delightful little Lake Retaud, this snowshoe trail takes you to the Chalet du Rard and then to Lake Retaud, in a tranquil natural setting with impressive views of the legendary peaks of the Les Diablerets mountains. 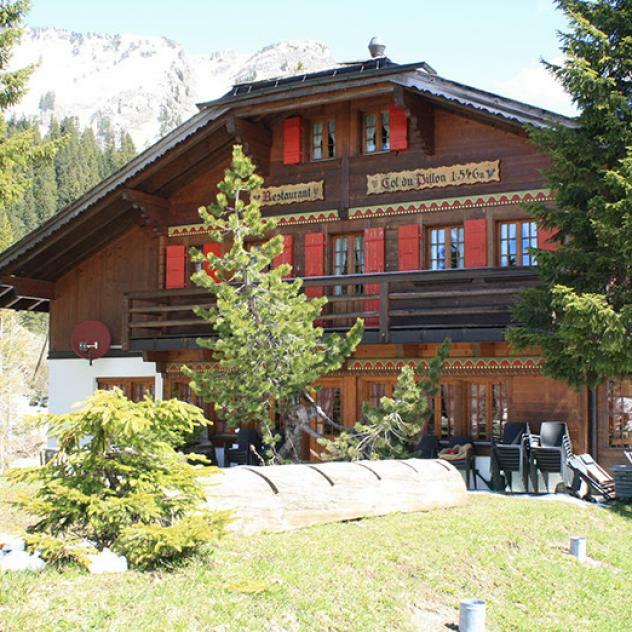 You’ll discover lots of picturesque places along this trail, like the Chalet du Rard, a mountain pasture chalet, facing the magnificent Les Diablerets mountains. Lake Retaud, a little mountain lake, will also delight you, with its stunning views of the surrounding mountains, such as the Becca d’Audon peaks, Scex Rouge, the Nägelihorn and the Les Diablerets glacier. Start by following the winter walking trail from the Col du Pillon, linking the cantons of Vaud and Berne. After a few minutes, the snowshoe trail leaves the walking trail and takes you in the direction of Le Rard, a pretty track between forest and snow-covered pastures. Once you get to the Rard mountain pasture chalet, take the time to gaze at the view in front of you. Then, continue to Lake Retaud, a small paradise nestled in a basin on the south side of the Palette. Here you can have something to eat in the restaurant with its modern wooden interior. Then return to the Col du Pillon by the winter walking trail through the forests and pastures. Marked in an anti-clockwise direction only.